This past week I had the distinct pleasure of attending the most fabulous of parties: A Casablanca themed party thrown by Madame Suzanne Eliastam and Jeffrey Stamen. Though located in Beacon Hill, the soiree was set in Rick’s Cafe American. For those of you who have not seen the classic black and white film, Rick’s is the place everybody goes. …kinda like The Franklin on a Thursday night, or Stella for last call. With the help of a few of her most trusted assistants, Madame Suzanne transformed her historic dwelling in to a swinging supper club. The guests dressed to the nines. 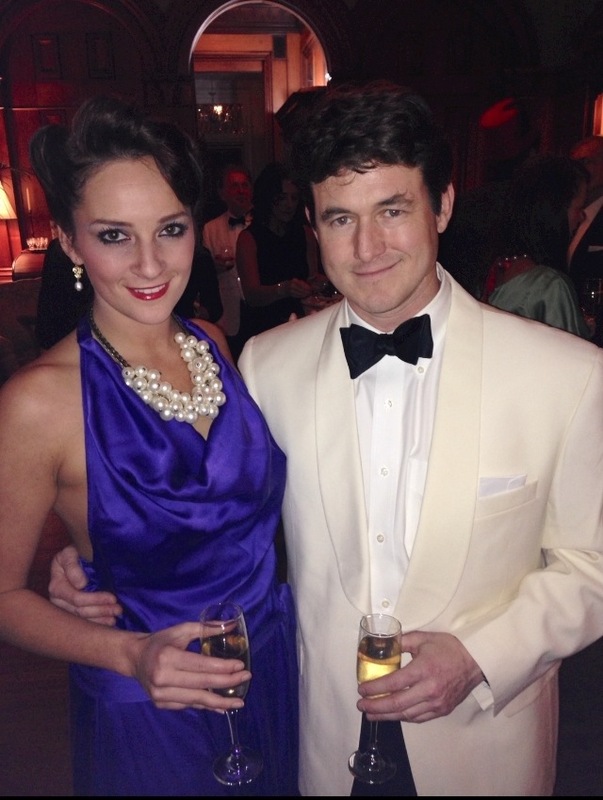 Women stepped out in style in their finest frocks, while men dawned their white dinner jacket. A red fez or two were also spotted. Mr. Bogart and Miss. Bergman were regretfully unable to attend, but the present guests more than made up for their absence. 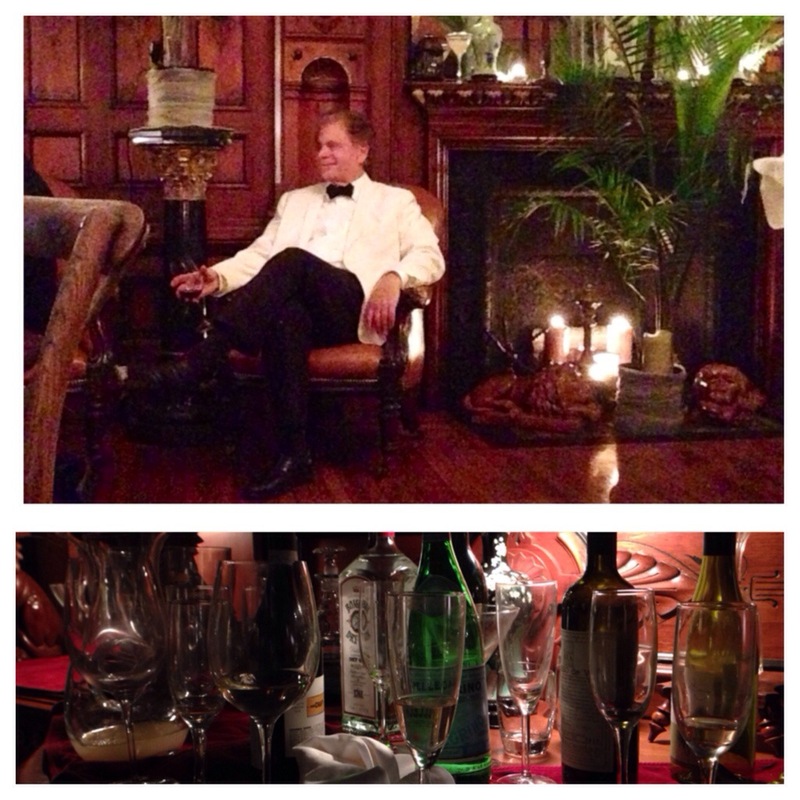 Sipping champagne with the dapper William Grote (of German descent… fraternizing with the enemy?) I sympathize with the french, as a show off this purple silk dress I bought in Paris a few years ago. This Casablanca party proved to be the perfect time to wear it. In conjunction with my 40’s “pin-up girl” hair and period make-up, I think my look came together quite nicely. The Host with the most Jeffrey Stamen settles in to Rick’s looking ever so debonaire. 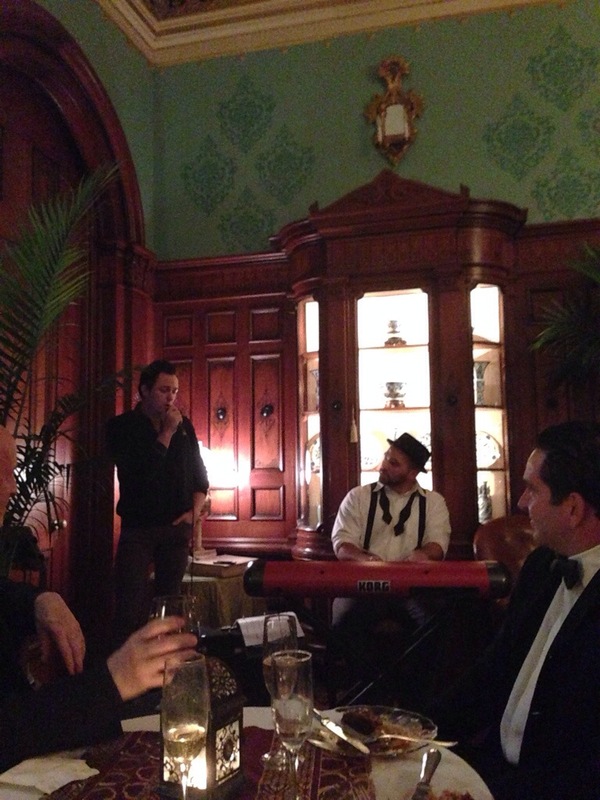 As Joseph Gordon Cleveland wowed the guests with his range of talents, Pianist Mike Flanagan soulfully played along. Not to be outdone by Mr. Cleveland, Flanagan continued to played all night long. He played old classics, some of our favorite songs and of course famous tunes from the film itself. He even but up with a few sing a longs. He was a star; truly an invaluable asset to the gathering. Not to mention how good he looks! It was a very elegant evening indeed. 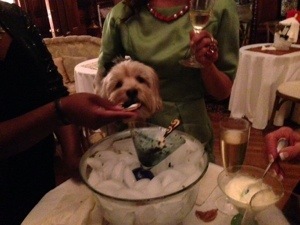 Even the dog ate caviar and wore a bow tie! With our glasses topped up with fine wine (mine with champagne) and our bellies filled with traditional Moroccan fair we danced the night away. 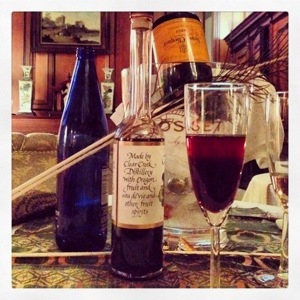 This party really had it all: unbeatable ambiance, decedent food, and great company. Surely the beginning of many beautiful friendships. Many thanks to all that made it such a beautiful and wonderful night. And an extra special thanks to our gracious host and hostess Jeff and Suzanne. Another great article! I feel I can tour the world, crossing all cultural and class borders just by sitting here and reading your articles. You use such articulate words with vivid pictures to fill my senses. In this article I feel the warmth of Rick’s Cafe with the taste of fine wine and cigars, the feel of silk, and laughter and music all around. Can’t wait to see where you take me next!